The LATA Lab activity in this research area has started in the year 1998. The necessary laser equipment (the two actively synchronized excimer and Nd:Yag laser) and the signal collection and data acquisition (the monochromator and the OMA III system) were available from the previous activities of the Lab. Initially, the LIPS experiments were performed in atmospheric air. 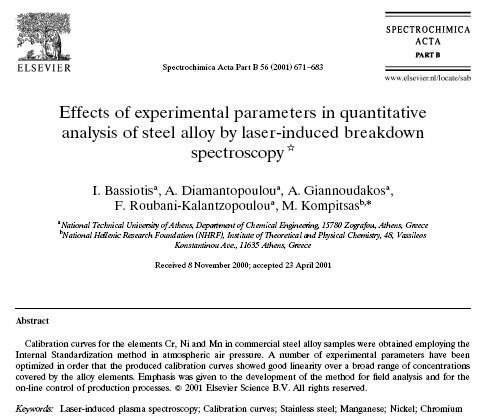 The samples were commercial stainless steel alloys and the Internal Standardization method was applied to quantitatively determine the concentration of the various alloying elements (Cr, Mn and Ni) with the purpose to develop a method of LIPS-based on-line control of the production process. 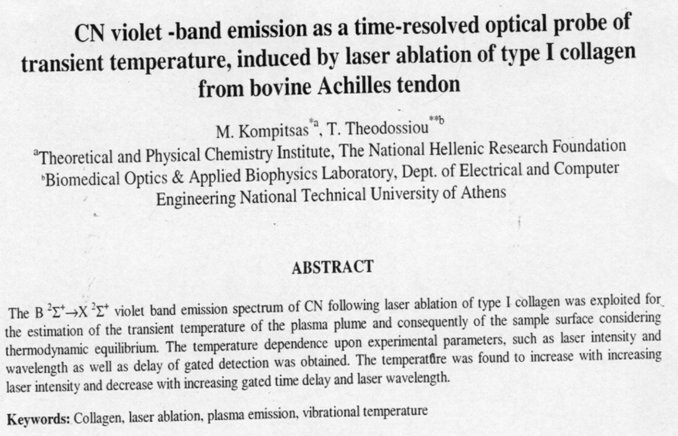 Using the same apparatus, we have determined the transient temperatures during laser ablation of Type I collagen from bovine Achilles tendon and these data are of upmost importance for laser surgery. Research continued with the determination of the halogen elements (F, Cl and Br) for industrial and environmental applications. Halogen determination is not an easy task and there are many reasons for that: halogens are strong electronegative elements that are very difficult to ionize. Moreover, their strong resonance emissions are in the below 180 nm (VUV spectral region). This sets severe restrictions to most practical applications: First, atmospheric oxygen absorbs strongly in this region, second there exist no CCD detectors with high sensitivity in the VUV region. Halogens were finally determined with increased sensitivity using a special IR gate-CCD camera, borrowed to us by the company Andor Technology, Belfast, N. Ireland. 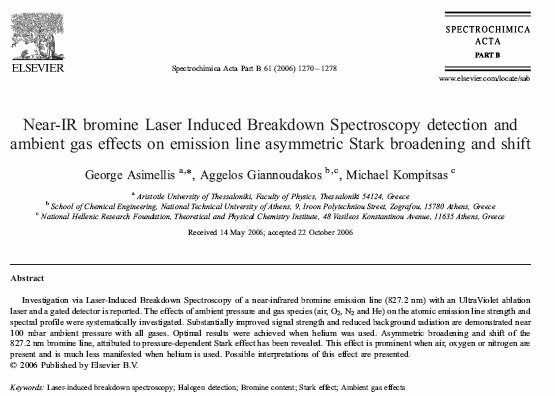 Moreover, LIPS parameters were optimized (laser wavelength, ambient gas type and pressure). 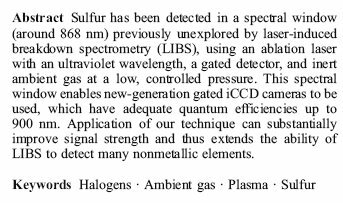 Similarly, the electronegative element sulfur has been quantitatively determined, while a new IR emission line (at 868 nm) has been proposed for detection for which line the Quantum efficiency of the CCD camera was higher than that for the sulfur 922 nm triplet used in the past. 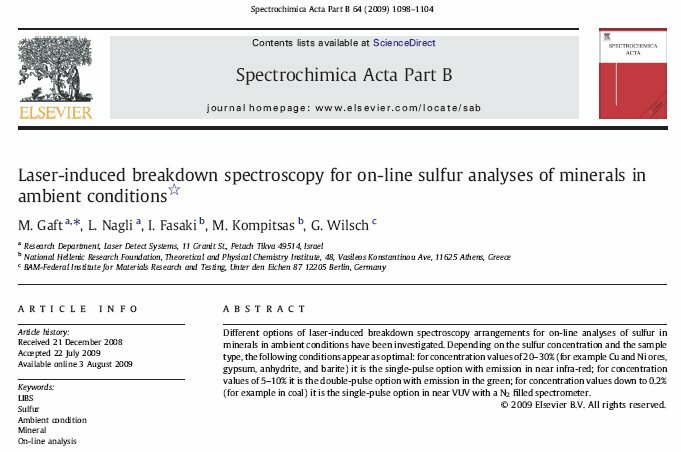 These results of ours were the basis for our next work concerning the determination of sulfur in on-line analyses in minerals in ambient conditions (mining industry). 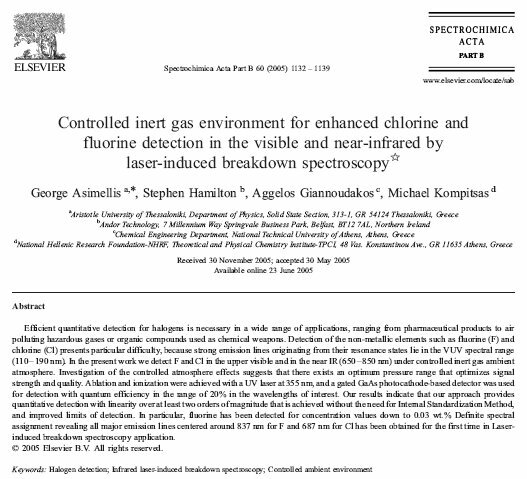 Further work concerns the development of suitable algorithms for wavelength calibration without the need of reference spectra. Some LIPS activity was related to industrial and environmental applications, such as Pt group metals determinations in the process of recycling of used automobile catalysts; on-line classification of phosphate ore as a means for a reliable and economical process for the mining industry; in-depth element profile identification for thickness measurements during a industrial quality process. (2) In situ rapid classification of individual ore rocks as a reliable, economical and environment beneficial process. 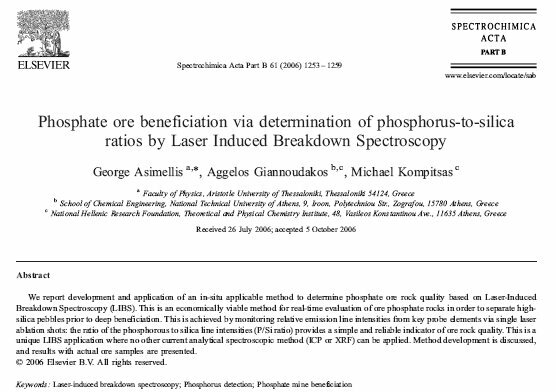 Test case: phosphate ore.
(3) Efficient quantitative detection for halogens (F, Cl and Br). 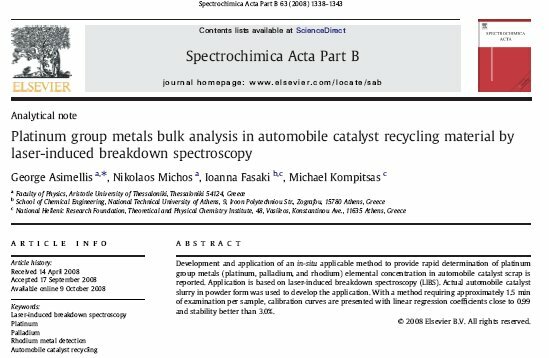 (4) Platinum group metals determination in automobile catalysts scrap for cost-effective recovery and recycling. 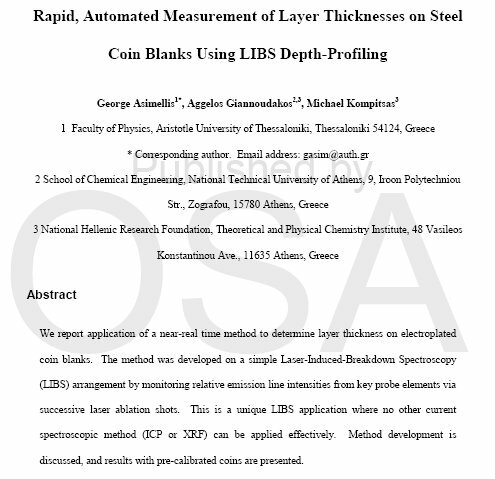 (5) In-depth element determination in multilayer thickness measurements for quality assurance. (6) On-line analytical instrumentation for the mining industry for environmental protection. Test case: Sulfur. (7) Determination of the alloying elements Cr, Mn and Ni for the steel industry. (7) Determination of transient temperatures for laser surgery.